Boy…has this been a CRAZY week! Connie and I have been super busy getting ready for our second Create with Connie and Mary LIVE event and WOW…do we have some super cool projects for our folks to make! My friends who are going to be helpers came over to my house yesterday to make their projects so they will be able to help others…oh what fun! This is also for the casology challenge – repeat! Speaking of fun…we have a super fun and easy sketch for you for the Create with Connie and Mary Thursday Challenge this week. I decided to go pretty simple on my card and do a masculine twist! Whisper White – 3 7/8 x 3 7/8, stamp solid triangle in Night of Navy and Lost Lagoon, stamp diagonal striped triangle in Soft Suede. Ink greeting with Night of Navy and Soft Suede, stamp on card front. Layer onto Soft Suede 4 x 4 and add to card front using dimensionals. Color some Perfect White Accents using a Navy Sharpie and add to card front on diagonal striped triangles. Add white ones to the solid triangles. Yep…it’s that quick and easy! This entry was posted in Clean and Simple (CAS), Create with Connie and Mary, Masculine and tagged Friendly Wishes, What's Your Type. Bookmark the permalink. Love, love this card. Thanks for sharing. What a great masculine CAS card using this sketch! You make it look easy, lol!! I know you’re going to have a blast on Saturday! Wish I could be there for the fun! I love your take on the sketch, Mary! The triangles are very cool paired with the bold sentiment! Love the use of the triangles and the solid and stripe combination. Fun card for a guy! Love the graphic feel of this – every time I see this set in the catalog, I want it, but I think this is the first real life card I’ve seen made with it – so glad you joined us at CASology this week! Mary, those geometric triangles make such an awesome repeat pattern! Love what you did with them, and the colours too! Thanks so much for joining us at CASology this week! VERY cool design, love the way you put them together!! Thanks for joining us at CASology! Love those overlapped triangles and the colors you chose for this CAS masculine card! 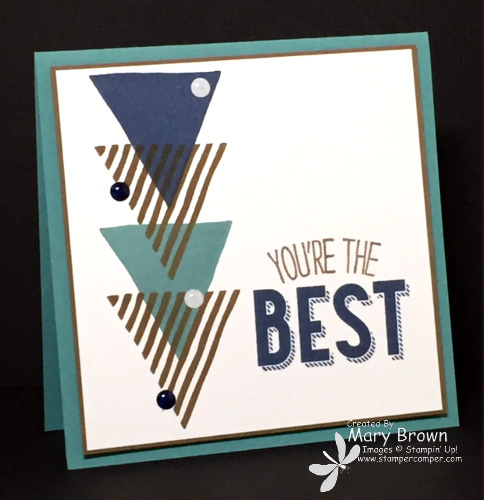 Love the graphic triangles – you are a whizz with this stamp set Mary, everything I see you make with it is fantastic!